SERV Surrey and South London and the Nationwide Association of Blood Bikes were honoured to have been involved in the launch of the Precious Cargo Project last Saturday. The project is the brainchild of the charity Motorcycle Outreach who, working with local government and health organisations, specialise in funding projects to provide motorcycles with full maintenance service to mobile health workers in remote areas around the world. The aim of the Precious Cargo Project is to raise awareness of the work the charity does and in particular to raise awareness of how many mothers in remote locations die in childbirth from complications which could have been avoided with the aid of medical professionals. The UK leg of the project will see bikers (mostly from NABB affiliated groups) taking a scroll to 50 hospitals all around the country, collecting signatures (and donations) from midwives and other healthcare professionals. The scroll will then be taken around the world on a journey facilitated by motorcyclists, midwives and midwifery students. 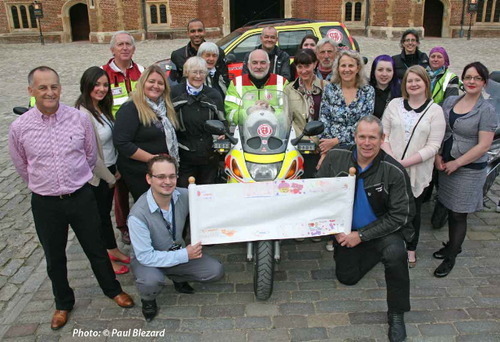 The launch, at Hampton Court Palace in Surrey, was attended by Mike Ney from SERV Surrey and South London and John Stepney from NABB, who was the rider on the first leg to Darent Valley Hospital, Dartford.